With this entry, I’m proud to participate again in the 7th Annual White Elephant Blogathon, hosted by Silly Hats Only, even though I’m now really late for its April Fool’s Day deadline. Come on, of course I was excited to see this. It’s a monkey movie. Even if it was terrible, it was guaranteed to feature some outrageous behavior not natural to the primate world. If artists like Stanley Kubrick, Clint Eastwood, Tim Burton, and Ronald Reagan have fallen for the hairy charms of our nearest ancestors on film, who am I to argue? Spymate is one in a series from director/producer Robert Vince, who is responsible not only for the somewhat-silly Air Bud series as well as its spawn, the Air Buddies series (awwwwww, puppies!). There are over a dozen films with an Air Bud connection–most straight to DVD–which may be beloved by children and perhaps those who adore cute doggies, but are tolerated/reviled by discerning parents who are forced to endure these cloying films time and again. Spymate, however, features a burgeoning star of the monkey-movie-genre, a chimp named simply Louie. Like a young Bruce Willis, Louie quickly has become a multifaceted action hero, dazzling on the hockey rink in MVP: Most Valuable Primate (2000), and shredding skateboards in its sequel (in name only), MVP: Most Vertical Primate (2001). 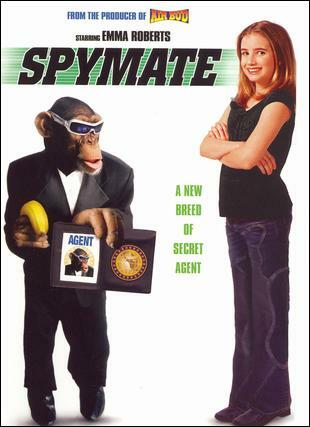 In this film, Louie plays an international superspy called Minky, who reenters the spy trade when his former human partner, Mike (Chris Potter), needs help rescuing his daughter (Emma Roberts), who has been kidnapped by an evil scientist (Richard Kind) in order to use her award-winning laser drill invention for fame and profit. Truth be told, the plot is dumb as hell and barely matters. Overall, one must realize this movie’s primary audience is children, and leaps in logic should be considered par for the course. Why, the leaps in logic are actually the best parts. The sheer amount of dizzying, disorienting cuts in the first 5 minute “rescue” sequence is staggering, likely because it’s the only way to showcase a chimp’s climbing, running and swashbuckling “expertise” as even remotely smooth or natural. Louie’s talents are best utilized in small, heavily edited action scenes, such as those where he performs karate against none other than Mr. Miyagi himself. It’s true – thanks to Robert Vince, Pat Morita has now suffered a worse career setback than the sequels in which he was paired with Ralph Macchio. The weakest parts of this particular movie feature non-primate characters, some of whom might even be offensive to some viewers. For instance, there’s an over-the-top Arab threatening to blow up the President, and Asian taking photographs, as well as transpose spoken R’s with L’s. Minky’s circus colleagues who join in the rescue are neither funny nor interesting. And while preteen co-star Roberts has got acting in her blood (she’s daughter of Eric, and cousin of Julia), she has difficulty finding a foothold in this poorly constructed film, that requires its viewers to believe Roberts is among the greatest innovators in science. 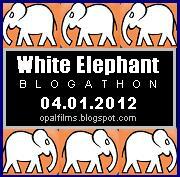 Posted on April 7, 2013, in Uncategorized and tagged white elephant blogathon. Bookmark the permalink. Leave a comment.